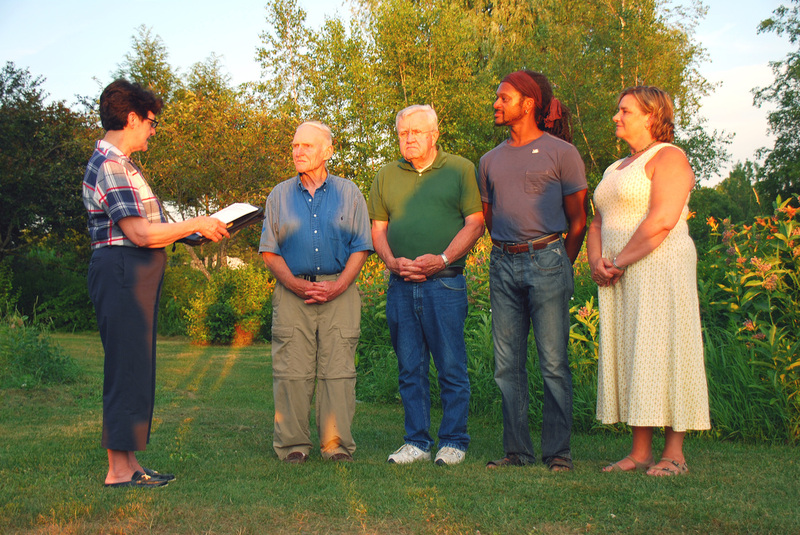 Rotary Club of the Winthrop Area welcomed new officers at an informal family gathering at Anabessacook Farm Bed and Breakfast. Attended by friends, family and visiting Rotarians from afar the food and fellowship was enjoyed on the deck of the B&B before the setting sun. Incoming President Kathy Thoreson detailed some of her plans for community service and fund raising in the coming year. The group was honored by the attendance of Rotary's Past District Governor, Jan Goddard, who addressed the group with a portion of Rotary history and conducted the installation ceremonies just before the sun set. "I've attended many, many Rotary ceremonies over the years" said Bill McKenna, an Augusta resident and Winthrop club member, "and this has to be one of the most relaxing and friendly event yet. The club has good energy and will continue to do well in the community." The Winthrop Area Club is made up of business professionals from Winthrop and the surrounding communities and meets weekly - Tuesdays at 0730 at the Conference room or the Winthrop Federal Credit Union on Highland Avenue. Visitors are always welcome. Photo: Sunset installation: Left to right: Rotary Past District Governor, Jan Goddard, "Lefty" McIntyre, standing in for Secretary Ryan Frost, Treasurer Phil McSweeney, Vice President Craig Hickman and President Kathy Thoreson.